Uche Ogbuagu, the right choice for Imo House Of Assembly? Home News Uche Ogbuagu, the right choice for Imo House Of Assembly? Amb. Uche Ogbuagu come 2019 would be representing the good people of Ikeduru at Imo State House of Assembly. Amb. Uche Ogbuagu has continued to change the lot of Ikeduru people by bringing lots of development to the people. Having established his business right in his village, road development, provision of potable water, youth employment opportunities and women empowerment to mention but a few. He has demonstrated through his numerous community development projects that he cares for the people. He has demonstrated through various selfless services to his town, that he knows what it takes to bring development to the grassroots. He will do same for the Ikeduru State Constituency. He is a man who has a different perspective about political God-fatherism. A devote Christian and strong believer, who is driven by the desire to engender the delivery of dividends of democracy to the people. For far too long the people of Ikeduru state constituency have been denied the representation they deserve. This sad situation is about to change as Amb. Uche Ogbuagu has stepped forward to speak up and fight for the progress of his people. Amb. Uche Ogbuagu was born to the family of late Pa Alexandra and Madam Lovendar Ogbuagu in August 1972 at Amii Village, in Akabo-Ikeduru Local Government of Imo State, Nigeria. Being the only surviving son of his mother, with two Elder Sisters, Amb. Uche Ogbuagu started his life’s journey from a rough point, as he inherited the spillover hardship of the Biafra-Nigeria war from birth. Due to several relocations of his parents at his tender age, He attended Amii Akabo Primary School, Asa Triangle Primary School Aba and later completed his Primary Education at, Abayi, Ariaria Primary School Aba. He acquired his Secondary School Education at Comprehensive Secondary School Okpu-Umuobo in Osisioma LGA, Abia State from 1986-1992. His talent in comedy and film acting came into notice while a junior student in the Secondary School. He was then able to organize and manage a students’ drama group, called ODENIGBO THEATRE which entertained the school and their visitors during various occasions and events, including the school annual inter house competitions. On leaving the Secondary School, Amb. Uche Ogbuagu started his discipleship training working for his mentor, Late Mazi Chike Gbujie in his Company, Astral Circle Enterprise, Aba, where he gained vast experience as a Video Cameraman, a Script writer, and comedy actor. Amb. Uche Ogbuagu became the most sought for and expensive master of ceremony in Abia State and beyond. Amb. Uche Ogbuagu, in full application of his creative talent introduced a new dimension to oratorical comedy by recording his debut album entitled, “BAD CONDITION” volume one, which took the Nigerian audio recording market by storm and opened the gate way of public interest for oratorical comedy in Nigeria. It is noteworthy to acknowledge Amb. Uche Ogbuagu as the father of modern oratorical comedy or Stand-Up Comedy. Today, Amb. Uche Ogbuagu did not drop his quest for education in preference to money. He moved on to Abia State University, Uturu, where he obtained a Bachelor of Arts degree in Mass Communication. Amb. Uche Ogbuagu, was given a Political Appointment in 2011 as Special Assistant to the Governor of Imo State on Entertainment and Chief Comedian of Imo State by His Excellency, Owelle Rochas Okorocha. He was promoted to Senior Special Assistant in 2013 in which capacity he served Imo State until he voluntarily withdrew his services on December 15, 2013. He has over 40 audio/video recorded works on oratorical comedy. He is the most outstanding producer of jingles East of the Niger, having over 1500 jingles on political and public enlightenment plus commercial/product jingles. He has many comedy films to his credit, the most prominent one entitled “NOTHING SPOIL”. He has single handedly organized and taken entertainment troupes from Abia, Imo, and Anambra States to International performances in Dubia, Germany, Holland, and in December 2013 to England (on the show tagged “IMO SHOW OF FAME”. He used his position as Senior Special Assistant to Imo State Governor on Entertainment to establish an umbrella union for all arms of the Entertainment Industry in Imo State, entitled “ENTERTAINMENT BUREAU IMO STATE”. Thus, giving the Entertainers in Imo State a single voice in Government. Amb. Uche Ogbuagu, as a great exponent of Youth Empowerment through talent development, has set-up special machinery for giving International exposure to budding talents of Entertainment in the Eastern States of Nigeria, which includes Entertainment troupe tours to Europe, Asia, and America. Amb. Uche Ogbuagu was conferred with a meritorious award of United Nations Peace Ambassador in 2014 in recognition of his outstanding contributions in propagating world unity through arts and comedy as he traversed the various continents with his performing troupes over the years. Amb. Uche Ogbuagu was the Head of Creative Media Department of the famous Transformation Ambassadors of Nigeria, TAN, the most intimidating political campaign war-horse ever created on the Nigerian political arena since independence. In his latest achievement, Amb. 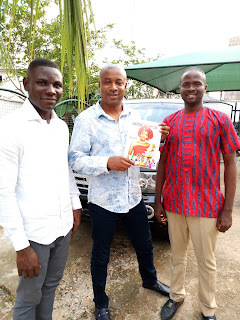 Uche Ogbuagu has added yet another White Eagle Feather to his crown by being The First Nigerian Artiste to establish and own two Commercial Radio Station, “MYRADIO 101.1 FM and GOLD 89.3FM OWERRI”. Amb. Uche Ogbuagu, has being helping the widows, the needy, the less privileged and the disable through his charitable organization Uche Ogbuagu Lovendar Foundation. Amb. Uche Ogbuagu is married to Mrs. Nkeiru Petra Uche Ogbuagu (Nee Onyekwere), the marriage is blessed with 6 children: 2 boys and 4 girls. So, let all thumbs be up for a Hero of Entertainment and Creative Media who is spreading the Gospel of Peace, Happiness and Healthy Living to all Humanity with his God given talents.